Westfield, NJ -- Did you know that most students no longer learn the skill of cursive penmanship? This means that historians in the future may not be able to read historic documents or even personal letters from generations back. 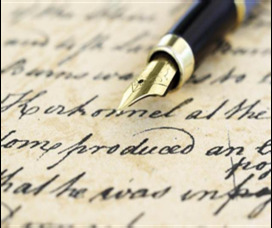 The Westfield Historical Society is sponsoring a mini-course in cursive handwriting penmanship course to help ensure that this important skill does not disappear. The 2-session course will be held on Saturdays, March 23 & 30, 2019. It will be held at the Reeve History and Cultural Resource Center, 314 Mountain Avenue, Westfield. Classes will be from 10:00-11:30 AM for a maximum of 12 students. Anyone in third grade and above is welcome. There is a $20 fee per student for the course payable on the first day. Materials will be provided. Retired teacher, Mrs. Kathy Barrett, will provide the instruction. Mrs. Barrett will teach the basics of penmanship using the Zaner-Bloser method. This 2-session mini-course will expose participants to size, shape, slant and spacing, and culminate in the creation of a personal style and signature. Research has shown that students who learn cursive writing may process information better. And in an age of screens, penmanship can provide a tactile and creative outlet activity with a beautiful result. To register, please call The Westfield Historical Society at 908-654-1794 or contact westfieldhistoricalsociety@gmail.com. The Westfield Historical Society celebrated its 50th anniversary in 2018. Since 1968, the 501(c)(3) non-profit Westfield Historical Society has worked to preserve, interpret and encourage interest in history, Westfield, and its residents through educational efforts and community outreach programs. For more information on the Westfield Historical Society and their events, visit http://westfieldhistoricalsociety.org and like us on Facebook.